modern ceramic hanging planters can bring outdoor flower power into your home and office today. will do our very best to solve your problem quickly and efficiently. 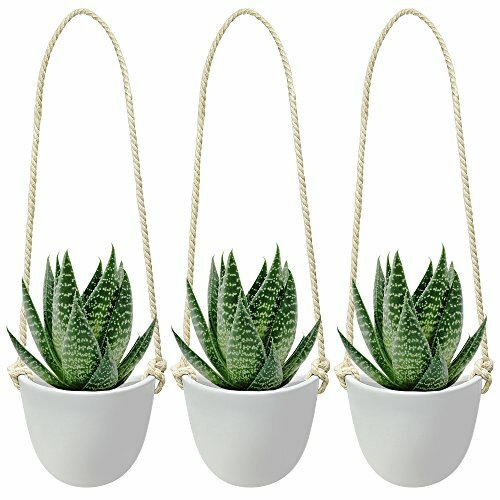 ELEGANT MODERN DESIGN: A set of 3 stunning contemporary, wall mounted containers that brighten any backyard, patio or balcony with a gleaming white glazed finish and luxurious and durable hanging rope. VERSATILE & FUN: Lively up any living or dining room, bathroom, or bedroom. Use outside in a building entrance, patio, or deck area. For those wishing to bring the garden and wellbeing into their day. Elevates indoor and outdoor herbs, small plants, and mini bonsai trees. FOR HOME AND OFFICE: Need an elegant way to clear your office desk? Our planters can stylishly organize pens, stationery, or mount in the shower for gels, pumice stones, and shampoos. Our planters have plenty of applications. 100% SATISFACTION GUARANTEE: Nellam is a USA family-owned business and your satisfaction is our top priority. We provide 30 day no questions money back guarantee and one year manufacturerÕs warranty on all products. If you have any questions about this product by Nellam, contact us by completing and submitting the form below. If you are looking for a specif part number, please include it with your message.